There are plenty of time tracking tools available online, both free and paid-for versions, that help monitor your workflow and better analyse your time. One such tool is Toggl. Toggl has been around since almost the beginning of online time tracking! It’s used by freelancers and small businesses worldwide and with the recent design and system upgrades, it’s looking pretty slick these days. Toggl’s recent design changes have made the dashboard very easy to pick out the key information – a huge improvement on their last display. Enter a client and / or project in the ‘Workspace’ area then colour code them to your choice for easier management. When logged in, your main dashboard will display each client and project along with the daily time spent working – both billable and non-billable. The time allocation is laid out in blocks with the total amount of hours displayed at the top of the page. There’s a few bits of extra functionality here such as exporting into CSV or PDF docs, but the focus is billing. So using the ‘Client’ and / or ‘Project’ dropdown menus, you can select what you want to display on screen. Now all the time during that day, week, month or year selected, for that one client is displayed. The only thing that I didn’t find particularly intuitive here is when it comes to adding / editing clients or projects – it took a little figuring out where to go to make edits, but once I found it, it’s straight forward enough. Basically, to edit client details, head into your ‘Workspace’ area and click on the ‘Clients’ tab where you can edit client account names and click ‘Add’ to create a new client account. To edit project settings, head over to ‘Projects’ then click on the project you wish to update, enter the new details in the field provided and click ‘Done’ or you can create a new project by clicking the ‘Create Project’ button and enter all relevant details. Easy when you know how! Anyway, that’s only one small niggle in an otherwise pretty perfect time-tracking world. 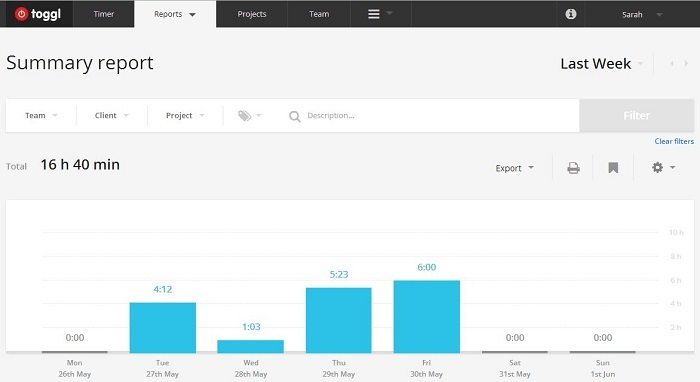 With the free version you can invite up to 5 team members to join your account, this is great if you regularly work with associates and want to be able to have an idea of the time they’re spending on tasks, and also from a monthly billing perspective. As you can see, I don’t do this since the associates that I use are on an ad-hoc basis, but it is a great additional feature if you do manage a larger team. If your team is bigger than 5 you need to upgrade to the Pro version which I’ll come to later. The desktop app is definitely worth downloading. This allows you to quickly and easily jump between projects. It works both on and offline and automatically syncs when online. So you never lose track of hours. Why go Pro? The main reason for going Pro would be the billing functionality it provides or if you manage large teams. The free version has no billing options. You can set your hourly rate so that when it comes to month-end Toggl will automatically crunch the numbers. 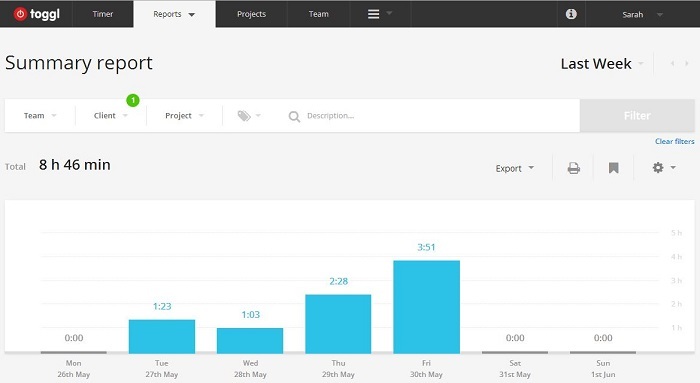 Advanced reporting, customised reports and bookmarks – the latter allows you to share your time tracking without them having a Toggl account – great if you want to share your time with clients. 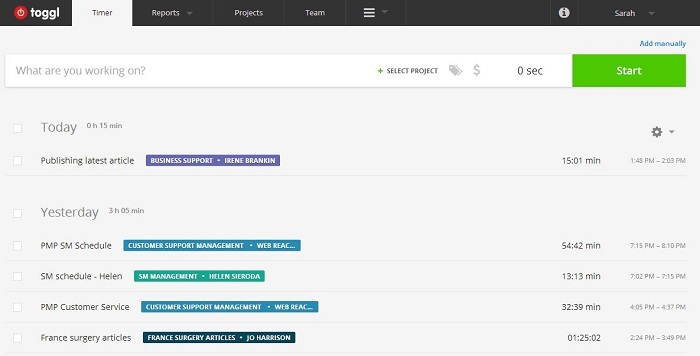 Toggl integrates with project management and invoicing tools such as Basecamp, Freshbooks and Teamweek. Allocate tasks to your team, include time estimates and regularly monitor time spent. Set up alerts on projects. Export reports into Excel format. And all of this just costs just $6 USD per month. Whether you go Pro or not, Toggl is easy to use, relatively intuitive, works both online and offline and hasn’t let me down yet! What time tracking tools do you use that you’d recommend? I’ve tried Toggl and I found it as a very valuable tool especially if you are looking to use timers to track your working time. On the other hand, if you are more the “register time at the end of the day”, Timeneye Time Tracking (http://www.timeneye.com) is a safe bet (it syncs with Basecamp and Redbooth and has autotrack features). I never heard about Toggl until now. 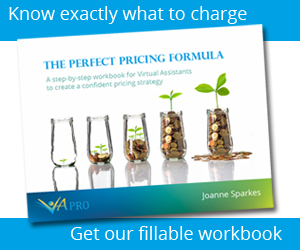 Though it really looks interesting and very helpful for Virtual Assistants. This might organize my work and time management. Thanks Sarah!